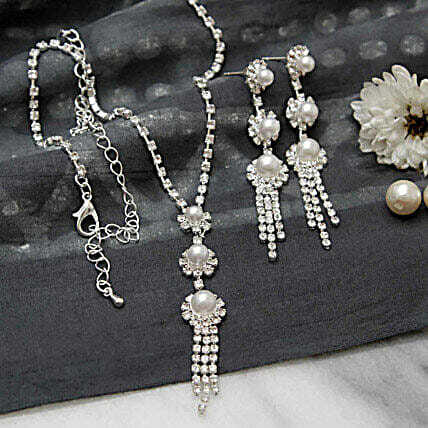 If you are gearing up for an ethnic look to attend a religious festival, you must check out this necklace set. The gorgeous pearls would make you look ravishing and you would be appreciated for the same. Wear it with a sari or gown and rock your party! It will not be possible for us to accept any request for product exchanges/returns. We will replace a product with a manufacturing defect. Please let us know as soon as possible when you receive a defective product. Since this product is shipped using the services of our courier partners, the date of delivery is an estimate. Your gift may be delivered a business day prior or a business day after the chosen date of delivery. A courier product is delivered separately from other hand delivered products. No deliveries are made on Sundays and National Holidays. The delivery cannot be redirected to any other address. All courier orders are carefully packed and shipped from our warehouse. Soon after the order has been dispatched, you will receive a tracking number that will help you trace your gift.